Auralex® Founder Eric Smith, pictured with students from Conservatory of Recording Arts & Sciences (CRAS) in Gilbert, AZ, after Smith’s lecture. 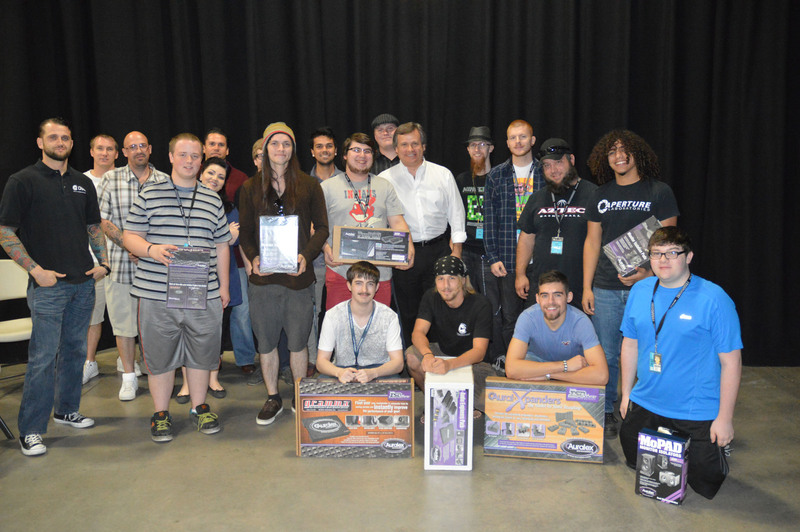 Students are shown with Auralex product prizes. Barry Rudolph, Instructor at Musician’s Institute, recalled the response to Smith’s presentation there: "What a fantastic and generous lecture Auralex President Eric Smith recently gave to the audio engineering students here at Musicians Institute in Hollywood. Our new Studio F was filled to capacity throughout the afternoon with a continuous stream of students enjoying his insightful and practical suggestions for improving the sound of their own project/home studios using various Auralex acoustic treatment products. Eric's anecdotal yet analytical tutorial style explains with clarity, precision and humor. The students loved it!" Photo Caption: Auralex® Founder Eric Smith, pictured with students from Conservatory of Recording Arts & Sciences (CRAS) in Gilbert, AZ, after Smith’s lecture. Students are shown with Auralex product prizes. Eric Smith is available for future speaking engagements, either in-person or remotely. For more information, please contact Robb Wenner, Technical Marketing Manager, Auralex Acoustics, Inc. at rwenner@auralex.com.